Everybody knows about Banff and Lake Louise, the postcard settings of the Canadian Rockies, with their Old World hotels, their peaks of imposing, showy beauty. And helicopter skiers have been spreading the word for years about the vertical stimulation that can be had in the Monashee Mountains, to the east. But the Canadian Rockies have so many sides — countless valleys and high-alpine towns — that it is nearly impossible not to stumble upon some place that feels fresh, relatively unknown, and still has that blend of air, light and wilderness of the north. We found such a place in Fernie, a town of about 5,000 people in a valley on the Elk River, about three hours' drive south of Calgary. It was a discovery to me, but Fernie has been getting plenty of attention from travelers from Australia, Germany, Japan and other distant posts. As to why someone would fly halfway around the world to spend warm-weather days in a little notch in the mountains of southeastern British Columbia, the answer was self-evident. Fernie reminded me of the Colorado Rockies in the 1970's. It could be Aspen without the gilded edge, or Telluride without the crowds, or Vail with affordable condos. In places it also reminded me of the Dolomites, in northern Italy, especially in the "Sound of Music" meadows high above town. Around Fernie, there are so many mountain-bike trails, solitary climbing peaks and gin-clear fly-fishing holes that it seemed gluttonous to expect an equally satisfying other side. But, yes, it has restaurants run by chefs with French accents and original ideas about what to do with Alberta beef, and spas where they squeeze the urban stress out of you, and places where children can escape the boredom of adult obsessions. I didn't find Fernie in the way that a traveler follows serendipity to a lost village. Those things don't happen in the Internet age. I love British Columbia, a province bigger than Texas, with multiple personalities. I love the rain forest and savage shore in the west, the sophisticated international style of Vancouver, the Okanagan wine country in the interior, and the skiing outside Kelowna. When the Winter Olympics come to Whistler in 2010, this province will get its full due. I had told a friend I was looking for someplace new for a summer vacation, not too far from my home in Seattle, not too full of itself. I said I needed at least four-sport stimulation, to satisfy the short attention span of my kinetic family. My friend directed me to cross the border and go east until I fell under the shadow of the Continental Divide. In Fernie, we could hike to a snowfield above timberline in the morning and golf in the afternoon. We could mountain bike at sunrise, fish for wily bull trout at sunset. We could chase a rainbow with our digital camera, as we did after a very theatrical thunderstorm, checking every shot to see if we could get it right. Or we could just lie around a pool at the base of the mountains and read, looking up every half-hour or so to notice how the light had changed on one of the rock shoulders. I have not seen Fernie in the winter. But the steep chutes and broad, flowered meadows of the Fernie Alpine Resort, where we stayed just south of town, made me want to return when the snow is deep. The Rockies are full of ghost towns and boomtowns. Fernie could have gone either way, but it has charted a middle course, hanging onto vestiges of its mining heritage, without seeming like yet another mountain town overrun by bicyclists in Lycra demanding seven kinds of mineral water. Fernie is 100 years old, named for a prospector who developed a rich seam of coal in the mountains around the Elk River. The town's founding legend has it that William Fernie was led to the area's coal after noticing a black necklace on a Kootenai Indian maiden. The young woman's father promised to tell the prospector the source of the stones if he would marry his daughter. Fernie promised, got his directions to the rich deposits, and then reneged on the deal. In return, the Indians laid a curse on the valley, promising fire, flood and famine. The fire came first in 1904 to the fledgling town, and then again in 1908. Floods arrived in 1916, when the raging Elk River jumped its banks. And something close to famine was felt during the Great Depression. The Kootenai tribe lifted the curse at a ceremony in 1964. But a reminder can be seen in the rock folds above town, a legacy of the curse, they say in Fernie, without winking. There, high on the creased face of the mountain, is the Ghost of Mount Hosmer, a shadow of a rider on horseback that takes shape in the late light of the day. Of course, nearly every town has its hoary legends built around regional quirks. But, truth be told, that rock took the shape of a galloping horseman. To celebrate its centennial, Fernie has been buffing and restoring its downtown, centered on Victoria Avenue. Dozens of original brick and stone buildings, sturdy and unpretentious, are home to restaurants and shops serving the new tourist class that keep these mountain towns humming. The makeover has widened sidewalks, added lighting and made downtown the kind of place where a stroller may want to linger. But Fernie had me, already, by its very look: it seems little changed from its prosperous mining days, with a chateau-style courthouse and well-kept old ethnic neighborhoods. Restaurants still serve simple slabs of protein, with berry pies for dessert, but that has not kept a good Mexican restaurant from taking root in one of the old buildings, or chefs from experimenting at some of the lodges on the edge of town. What to do: I would not recommend Fernie for the slothful. I take that back: the slothful who like a mountain view with their indolence will find Fernie to their liking. Everyone else should prepare to multitask. The weather rhythms of the day shaped our schedule. Mornings were almost always clear, and nearly windless, cool enough for long, leisurely hikes. Many lodges offer guided tours, which are particularly useful for wildlife and wildflower enthusiasts. The trail system is extensive, and fairly obvious, so we chose to take our hiking expeditions without a guide. Fernie's base elevation is around 3,500 feet, which is not very high by the standards of the Rockies, but it also means most people will not have altitude headaches in their first couple of days. By contrast, Aspen's floor is better than 8,000 feet. Coming from sea level, I seldom sleep my first night in the Colorado Rockies. But in Fernie, there was no transition problem. At the Fernie Alpine Resort, the Timber Express chairlift runs for certain days of the year in summer, giving hikers a chance to start their wanderings higher up, near 6,000 feet. To me, taking a chair ride to a hike is cheating. Around Fernie, it takes only 15 minutes or so of easy switchbacks to get up high, and from then on, the scenic rewards are endless. The valley, when we were there in July, was deep-green and deep-carved by the river, surrounded by muscle-bound peaks still holding lots of snow. The wildflowers had not yet peaked in the meadows. Trail signs warned of bears, and guides said sightings were numerous, so we took seriously the caution about making noise — even off-key singing — when strolling up to the clouds. As regular as a Red Sox swoon, heavy thunderclouds formed every afternoon, fevered and purpled, and then burst into some sort of tantrum, either a brief shower or a lightning storm. As long as we had gotten off the trails by then, the storms were entertaining. But I have been stuck in storms like that, and it is best to have a good raincoat along and a plan for finding shelter before the gods throw down their thunderbolts. At lower elevation, the easy two-mile Lizard Creek Nature Trail at Mount Fernie Provincial Park is a good interpretive walk. 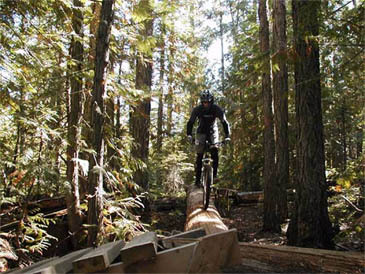 The mountain biking is extensive, with a well-marked trail network. Routes range from flat, daydream-perfect rides around town, along the river, or to a lake or provincial park, to more challenging routes on the marked trails of the Fernie Alpine Resort. A good source for bicyclists, and hikers, sold in town, is the Fernie Trail Guide. Golf is not something I usually associate with mountain vacations. But the wraparound scenery of the Fernie Golf and Country Club was enough of a lure to get me on a good walk spoiled with my 14-year-old son — twice. A 6,556-yard, par-70 course, the links have been rated among the top 25 courses in British Columbia. The fairways were a bit narrow, with enough water and forest hazards to prompt the use of anger management skills. But then, I'm a hacker, so what do I know? Again, seeing the mountains in all their moods, a different glimpse at every hole, was enough. The course is at the north edge of town, on the flat valley floor. The fishing in phenomenal, even right in town. You need a temporary British Columbia fishing license, a few hand-tied flies sold by local merchants, some patience and little else. 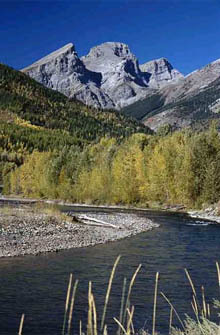 The Elk River carries snowmelt from the west-slope Rockies through a long, deep trench that runs north to south. 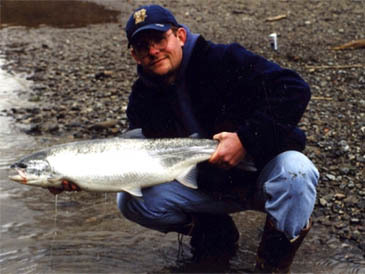 When the river is clear, between major periods of runoff or storms, it is heaven for dry-fly fishing. 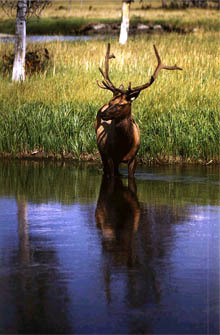 Canadians say the Elk is the best cutthroat stream in the country, though such fishing boasts are seldom settled. The river is swift, with decent pools, and best fished in the early evening. We wandered the banks right in town, but many anglers choose to raft the Elk, with a guide. For indoor pursuits, there was food and wine at the lodges or restaurants, and the occasional spa indulgence. At Lizard Creek Lodge, where we stayed, my wife, Joni, and I bought an hour each of something called aromatic hydrotherapy — a soak in a deep, jetted tub, with candles of lavender and other scents, and the added pleasure of a Norah Jones compact disc. Afterward, we watched a mountain sunset from the deck, sipping a British Columbia pinot noir. Fernie had made some new friends. 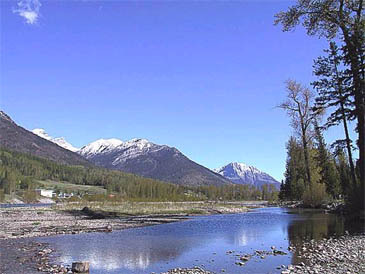 Fernie is in southeastern British Columbia, on Highway 3, three-plus hours' drive south of Calgary, four and a half hours northeast of Spokane. The nearest airport is Cranbrook, an hour's drive away, which has regular flights to Vancouver and Calgary. 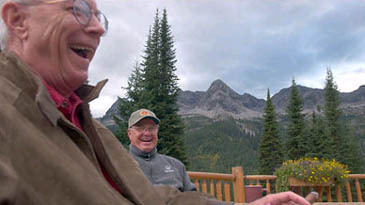 The Fernie Alpine Resort is a four-season destination, (866) 633-7643 or (250) 423-4655; www.skifernie.com. Its chairlifts serve skiers in winter and early spring and mountain bikers and hikers in summer. An extensive trail system around the resort means the hiking season generally extends through October. There are many lodges and condominiums for rent at the resort, and four restaurants. Our small suite at the Lizard Creek Lodge cost $154 a night in July, at 1.30 Canadian dollars to the United States dollar. The suite is $194 to $212 in winter (more for Christmas week) and $112 in spring and fall. In town, lodging ranges from the Fernie Hotel and Pub ($22 in summer, $30 in winter) to the Best Western Fernie Mountain Lodge (from $88 in summer, $118 in winter). Central reservations: (250) 423-2077. At the big-timbered dining hall in the Lizard Creek Lodge, chefs serve fresh British Columbia seafood and lamb and beef from the interior. Dinner for two, with wine: $90. A riverside restaurant in town, Rip 'n Richard's, is a favorite of locals, with wood-oven pizzas, pastas and bison burgers, each of which is under $15.